What a year it’s been! In 2017 it was market heaven for most investors. The S&P 500 (SPY) not just delivered more than double its historical return of 9.2%, but did so with a peak decline (from all-time highs) of just 3%. That’s compared to the average intra-year peak decline of 13.8% since 1980. 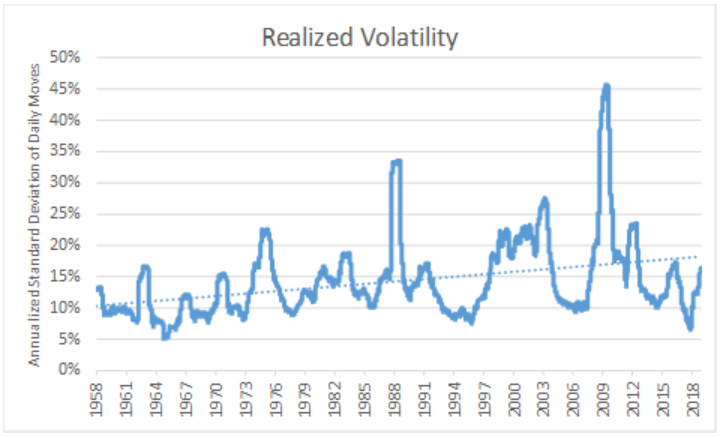 It was one of the best years ever, with the lowest volatility in over half a century. Well, volatility came roaring back with a vengeance in 2018, with the stock market experiencing not just one, but two corrections. 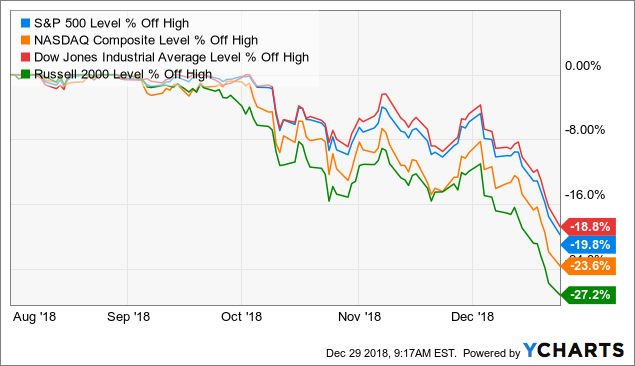 In fact, here’s how the S&P 500, Dow Jones Industrial Average (DIA), Nasdaq (QQQ), and Russell 2000 (IWM) fared by their December 24th lows (so far). The Nasdaq and Russell 2000 (small caps) were both firmly in bear markets, while the Dow and S&P came within a stone’s throw of ending the longest bull market in US history (technically, it’s still alive). What’s more, all four major indexes are now negative for the year, which means stocks are set for their worst performance since 2008. But my point here isn’t to point out what a crummy year it’s been for stock investors, but rather to point out three valuable lessons we need to learn from this crazy year. Lessons that can help us not just become better investors over time, but most importantly maximize the chances of achieving our long-term financial dreams. If it feels like this has been an especially volatile time for stocks, that’s because it has been. In fact two weeks ago we had the worst week for the market since 2008, and are currently on track for the worst December since 1931 (at the peak of the Great Depression). But the thing about volatility is that it doesn’t just come and go over time. Since 1958 market volatility has been cyclical, but trending steadily higher. As Blackstone’s Byron Wien explains, this is largely a function of both the increased popularity of passive investing as well as computerized trading (which is how passive funds invest their funds). In addition to market cap weighted index funds causing periods of blind selling regardless of valuations and fundamentals, you also have robo trading programs that are designed to purely sell, or even short stocks, based on certain technical indicators (which also ignore valuations and fundamentals). As December has shown us, even high-quality companies, with excellent fundamentals and strong growing cash flow, can become deeply unpopular with the market at times of extreme fear. And thanks to nearly half the market being invested in ETFs, and up to 90% of daily trading being run by computer (including based on headlines and even Trump tweets), the market can become incredibly stupid in the short-term, resulting in stock prices becoming completely disconnected from either their fundamentals or the fundamentals of the economy or overall corporate earnings. As Albert Einstein said, “Two things are infinite, the universe and human stupidity, and I am not yet completely sure about the universe.” Well, this is also true of the market. When investors get scared enough, then the potent combination of blind ETF induced selling and computerized trading can lead to some truly shocking sharp and short-term declines. Harvard finance professor Xavier Gabaix’s 2005 study Institutional Investors and Stock Market Volatility looked at the October 19th, 1987 (Black Monday) 22.6% stock market decline (the worst in US history). That kind of decline under standard probability theory should occur once every 4.6 billion years. However, the world is far more complex than standard deviation curves would have you believe (Black Monday was a 20 standard deviation event which is essentially impossible). 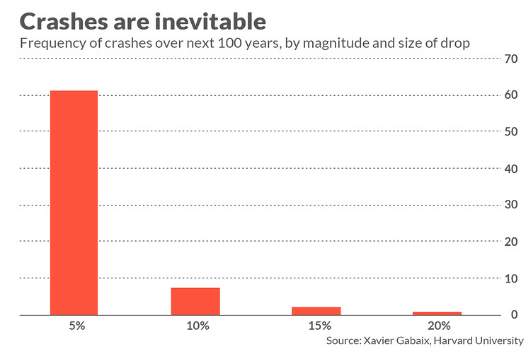 But while a 20+% one day crash (that plunges us instantly into a bear market) are extremely rare (but far more likely than most investors realize), severe 10% daily drops are to be expected, per Professor Gabaix, about every 13 years. 5% market declines are likely to occur 61 times per century, or on average once every 1.6 years. 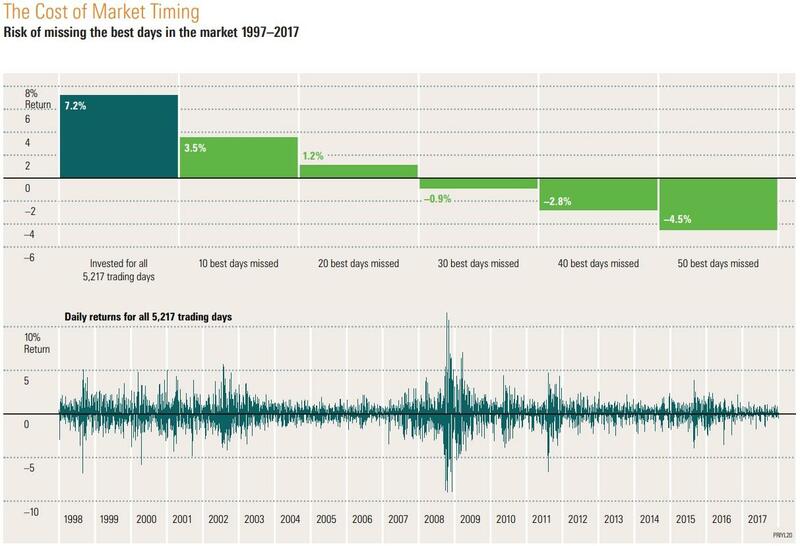 As Hulbert points out, the last 5% one-day market decline was in August 2011, and the last 10% market decline was over 30 years ago. Thus we’re actually overdue for a single-day stock market decline that would instantly put us into a correction (or possibly a bear market). But it’s not just wild one-day broad market declines that have investors spooked these days. 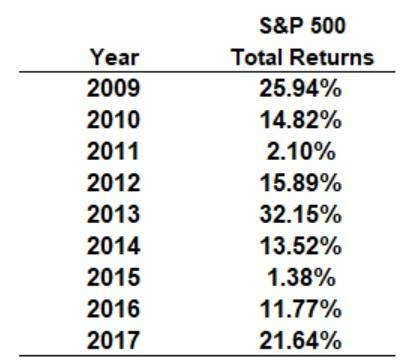 Another lesson from 2018 is that even when the S&P 500 isn’t in a bear market, your portfolio might be. While the stock market never officially entered a bear market (defined as S&P 500 closing down 20% or more below its all-time high), on December 20th 60% of the S&P 500 companies were in one (a figure that rose to about 66% by December 24). 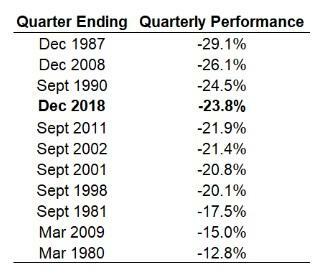 What’s more as far as quarters go, as of December 21st, the S&P was having its 14th worst quarter ever. 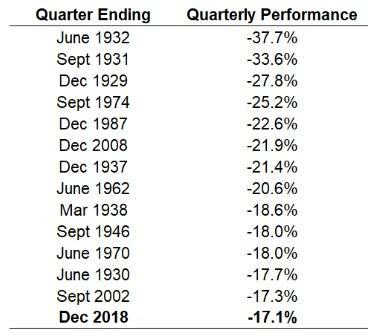 On December 24th, the biggest Christmas Eve drop in history, the quarterly performance of the S&P 500 became the 9th worst ever. But as bad as Q4 has been for the broader market, as we’ve just seen, individual stocks often faired far worse. On December 21st, the Russell 2000 (small caps) was suffering its fourth-worst quarter since its inception in 1979. When the market appears to have bottomed December 24th (yet to be determined), it became the 3rd worst quarter ever for US small caps. The point is that, depending on what you actually own, even standard corrections can be far more painful at the individual level. Which brings us to the most important lesson of all from this memorable 2018. Let me be very clear that I am NOT trying to scare anyone out of long-term investing. 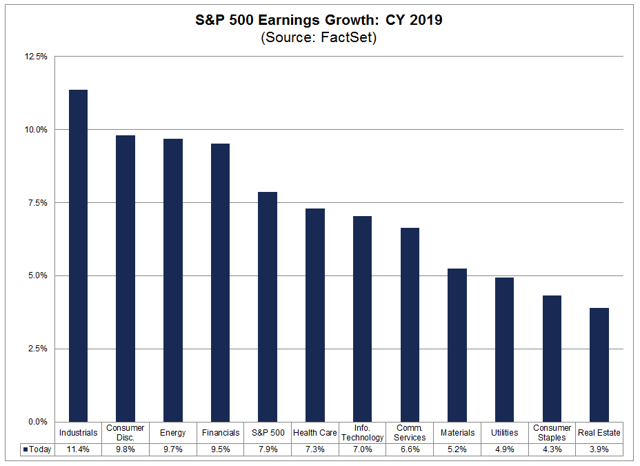 That’s because the current economic and earnings fundamentals are still pointing to positive growth over the next year or two, and today’s valuations are extremely attractive. For example, right now most analysts expect about 8% EPS growth for the S&P 500 next year. Even energy stocks, despite the fastest oil crash in decades (43% in two months), are expected to generate nearly double-digit earnings growth. 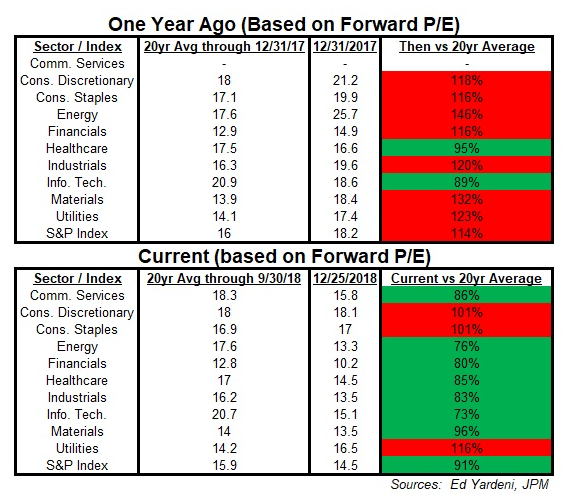 Today the S&P 500’s forward PE ratio is just 14.2, and most sectors are historically undervalued, especially compared to a year ago. What do today’s historically attractive valuations mean in terms of future returns? Well, over the short-term (1-year), it’s hard to know. But historically a forward PE of 14.2 has resulted in about 17% 12-month returns. 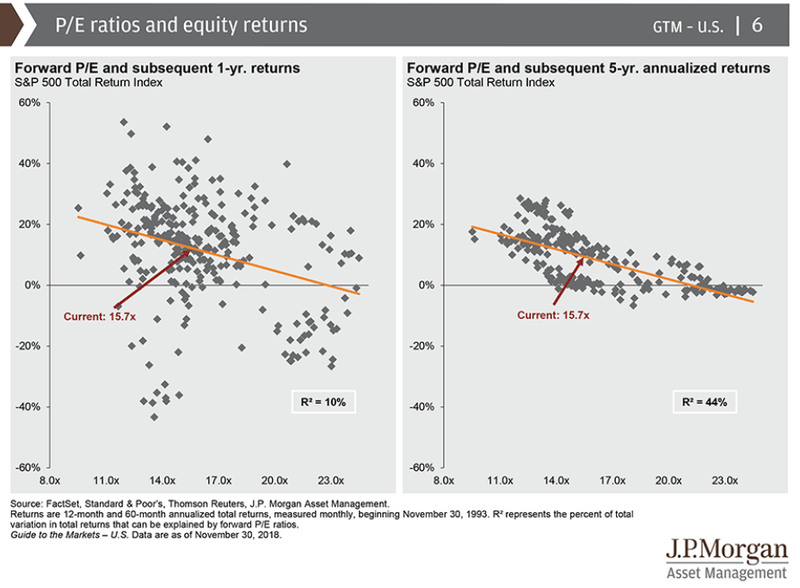 But over the long-term (five years) total returns become far more predictable and today’s valuations point to roughly 15% returns. Don’t trust forward PEs? Well, then let’s use trailing earnings. The S&P 500’s TTM PE is currently 19.1. 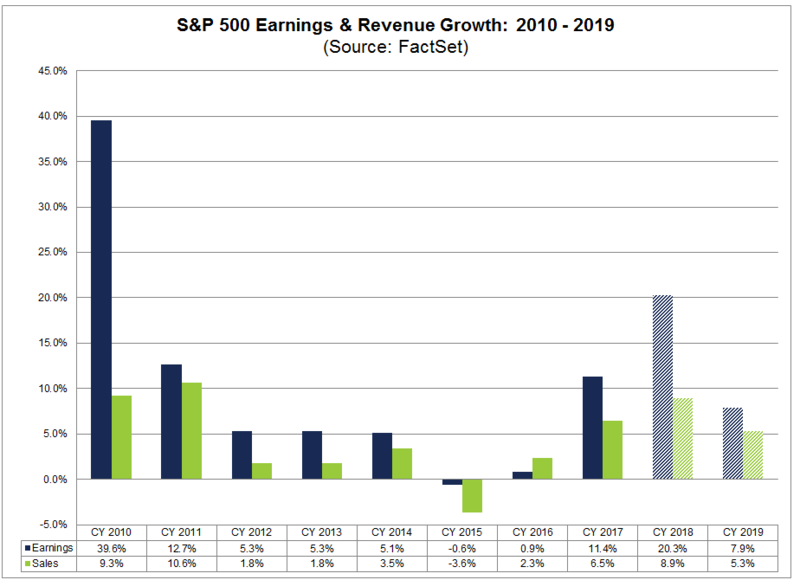 The market’s 20-year average TTM PE is 19.4, which means that earnings growth next year should drive at least modest returns, even if stocks remain just fairly valued. And keep in mind that the stock market is actually one never-ending cycle of alternating greed and fear. This is why just as stocks tend to overshoot to the downside (as they just did), they also overshoot to the upside. That’s why since 1926 the average 12-month post-correction rally (from the low) has been 34% (not counting dividends). 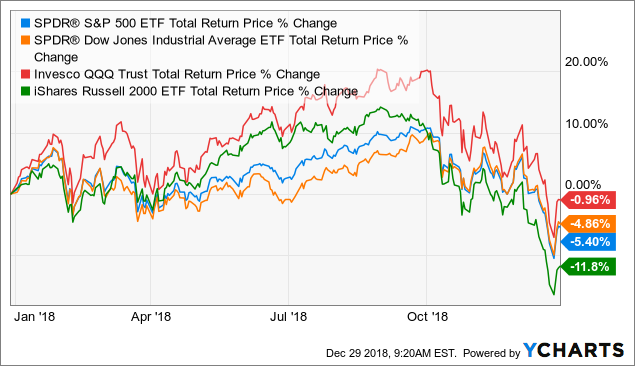 In today’s market that would equate to a 36% total return for stocks by the end of 2019 (from December 24th close). Of course, that is merely a historical average. Historical data only shows what stocks are likely to do, and is not a guarantee of what they will do (no one can make such guarantees). But remember those scary quarterly declines for both the S&P 500 and Russell 2000? Well, here’s the good news. After such a major shellacking, stocks almost always rally strong and hard in both the short- and long-term. With the exception of 2001 (9/11) and 2002 (tech bubble bursting), even small-cap stocks have never followed such a miserable quarter with a negative 12-month total return. 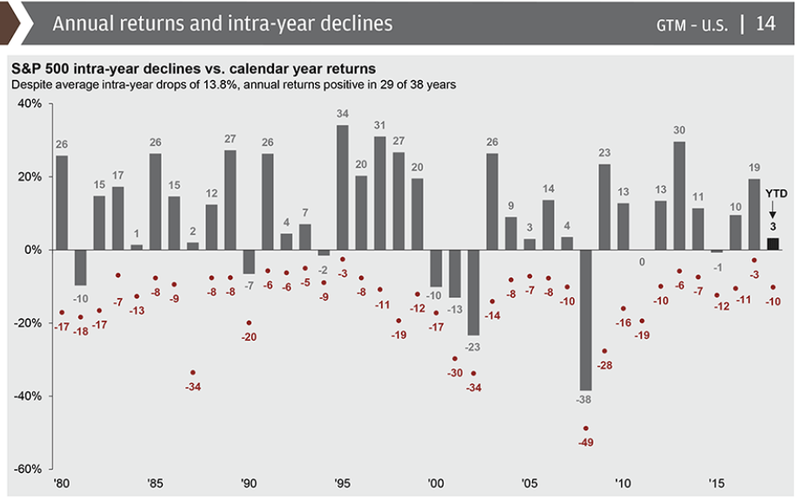 And over three and five years periods following such quarters, negative returns have literally never happened. That’s not to say that such a thing is impossible, just highly improbable unless you get a perfect storm of events occurring. One possible catalyst for stocks to still be down in 12 months might be the US defaulting on its debt during a failed debt ceiling showdown which Goldman Sachs (GS) has warned is coming between August and October of next year. But barring an extremely stupid and catastrophic blunder by our government, stocks are likely to be up in a year, potentially a lot, thanks to today’s highly attractive valuations. But wait a second?! Didn’t I just warn investors that Wall Street, due to the infinite stupidity of investors and the dominance of trading by computers, can be crazy volatile? Didn’t I point out that we’re overdue for not just a 5% single market decline but even a 10% single day bloodbath? Indeed I did. The final lesson of 2018 isn’t that investors can, or should, attempt to avoid volatility, but rather safeguard their portfolios against it. Believe it or not, stocks haven’t been the best-performing asset class in history despite gut-wrenching volatility but because of it. That’s because most of the market’s returns come from just a handful of its best single day gains, which are almost all clustered during times of peak downside volatility. Missing just the market’s best 30 days over the past 20 years would mean that an investor in the S&P 500 would have given up all positive total returns. Miss just 50 of the best days and over 20 years, your portfolio would have declined by 60%. For context, the peak decline during the Great Recession was just 57%. What this effectively means is that good market timing is essentially impossible, and one of the most destructive things you can try with your portfolio. Literally, billion-dollar hedge funds and large investment banks (like Goldman) have spent fortunes on trying to perfect market timing systems, including using an army of quants and AI-driven algorithms. None has yet succeeded in mastering market timing (if it had, it would own most of the world by now). The key to harnessing the awesome wealth-building power of the stock market is not to avoid short-term volatility, but rather to avoid a large permanent loss of capital. Or as the infinitely quotable Warren Buffett put it, the key to good investing is to remember two important rules. “Rule No. 1: Never lose money. Rule No. 2: Never forget rule No 1.” Now as always Buffettisms need to be clarified. The greatest investor in history isn’t literally saying that you can avoid losing money on every single investment you make. Rather he means all investors need to ensure their portfolios lack a critical point of failure, which results in disastrous mistakes, like selling perfectly good investments during a bear market, at ludicrously low valuations. Or to put another way, you need to avoid being a forced seller of quality stocks during a market decline. Now I too have made the mistake of falling under the siren song of margin. In fact, that’s why for the next 15 months I’ll be unable to participate in the glorious bargains all around us because I have to eliminate my leverage to zero and start building up cash reserves. I’m very fortunate that my dangerous dabbling with leverage isn’t likely to actually force me to realize terrible losses on otherwise great stocks. My best friend wasn’t so lucky. In the last 2 weeks, margin calls have forced him to realize losses that wiped out two years’ worth of gains. The price I’m paying for my mistake is missed opportunity. His is being forced to lock in catastrophic paper losses on perfectly good and ridiculously undervalued blue-chip dividend growth stocks. While margin isn’t necessarily of the devil, Buffett’s warning against it (which I now heartily endorse and will personally live by going forward) pertains to the vast majority of people. Remember that leverage amplifies not just losses and gains, but emotions. And it’s emotions, particularly severe fear during downturns, that is the greatest single enemy of most investors. That’s why over the past two decades, the typical retail investor has underperformed every asset class, and barely stayed ahead of inflation. Which brings me to the biggest point of failure for most people (even those who wisely avoid margin). That would be the wrong asset allocation. Since WWII, the average correction has lasted (peak to peak) eight months, and the average bear market (82% of which occurs during recessions) 35 months. Since the first rule of investing is to avoid a permanent loss of capital, you need to be able to avoid panic selling even when stocks fall to shockingly low levels (and with sometimes terrifying speed). This is where the right capital allocation comes in. Asset allocation simply means your portfolio’s mix of cash/bonds/stocks. The right asset allocation is essential to being able to emotionally and financially endure the market’s inevitable future declines. The right asset allocation will differ for everyone based on your risk tolerances, goals, time horizon, portfolio size, income, savings rate, etc. You can talk to a certified financial planner (a fee-only Fiduciary that can’t peddle you expensive mutual funds they get kickbacks on is best) to determine the right asset allocation for you. Note that your asset allocation will change over time, and might require periodic portfolio rebalancing (as stocks and bonds in it rise and fall and your life circumstances change). 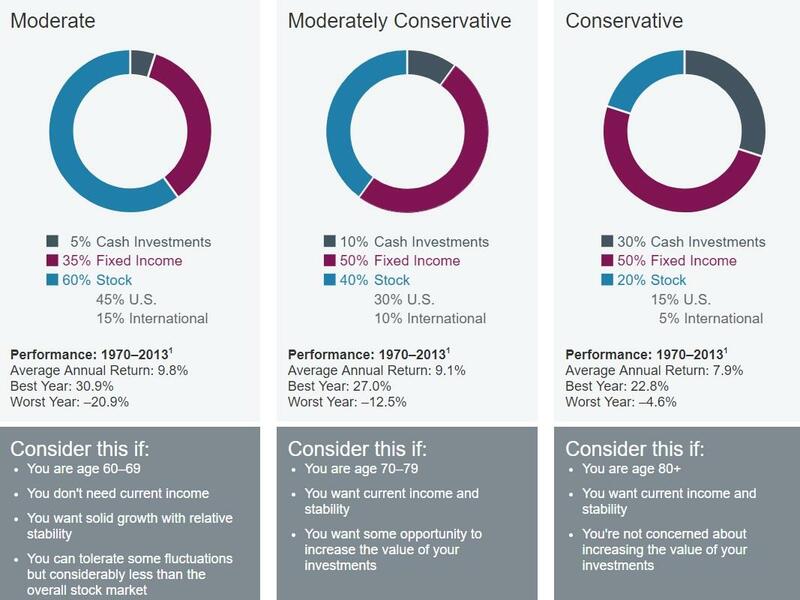 Here’s an example of the standard asset allocation Schwab recommends for the typical retiree. Those are some good overall asset allocation recommendations, but here’s the most important thing to remember during corrections and bear markets. Cash is king. Or more specifically, cash is what pays the bills during retirement (and allows you to buy quality stocks at fire-sale prices). Since the average bear market lasts for three years (before stocks are back to all-time highs), you want to have three years’ worth of cash available to supplement social security and any pension you may have. What if the bear market is more severe and longer than average? That’s certainly possible. 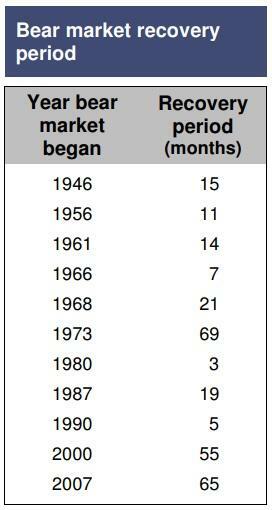 The longest recovery time (from the bear market low to fresh all-time highs) was 69 months or nearly six years. This is where bonds come in. Not just do they provide income, but due to falling interest rates and a flight to safety, bonds tend to rise during a bear market. So if you are tapped out on cash equivalents (like Treasury notes and money market accounts), you will likely be able to sell bonds at a profit to cover your expenses. And since cash doesn’t decline in value, and bonds tend to rise during a big decline, your cash/bond allocation will help decrease your overall portfolio’s decline, making it easier to avoid panic selling your stocks (emotional point of failure). For most people being 100% in stocks is a bad idea. Unless your portfolio is large enough to live entirely off safe and growing dividends during retirement (the goal of my new Deep Value Dividend Growth Portfolio), you will need some cash and bonds to be able to take full advantage of the wealth-building power of stocks. Remember the best stock investing strategy on earth is useless if you can’t emotionally or financially stick to it through the entire market cycle. During corrections (or possibly a non-recessionary bear market) like this, peak market declines and recovery times are shorter than during a typical bear market. So use how you’re feeling now to test your risk tolerance and determine if your asset allocation is actually right for you. If you’re losing sleep now, when stocks appear to have bottomed after merely a 19.8% decline, you’ll want to make sure that you are less exposed to stocks when the real bear market finally arrives. That can help you avoid emotions (or financial necessity) being your critical point of failure, no matter how unpredictable or crazy the infinitely irrational (in the short-term) and increasingly computer-driven market becomes. I’ve been investing since the age of nine (23 years). And I’ve been a professional analyst/investment writer for four. Yet 2018 has still been eye-opening for me, highlighting the fact that the only predictable thing about Wall Street is its unpredictability. Don’t let 2017’s freakishly small drawdown fool you. Volatility is not just normal, but has been gradually rising over time, thanks to the growing popularity of ETFs and computerized trading. In the future, we can expect not just similar volatility, but possibly some REALLY wild short-term swings, including a 10% single-day market flash crash that’s now historically overdue. And while the media may fixate on the broader market (S&P 500 most of all), the fact is that even a moderate downturn, like this correction, can translate into a bear market for even high-quality stocks (including blue-chips and dividend aristocrats and kings) and individual investor portfolios. But don’t let high volatility and the occasional bear market scare you away from the most time-tested and effective way of building long-term wealth ever discovered. The market’s great historical returns are not despite volatility, but a direct result of the very same short-term gut-wrenching declines investors so fear and hate. That’s why the most important lesson from this wild 2018 is that risk management isn’t just important, it’s the most critical part of your long-term investing plan. The best investing strategy in the world will prove utterly useless if your emotions or finances don’t allow you to stick with it long enough to work. Investors need to make sure their asset allocation is right for them. This means holding the right mix of cash/bonds/stocks to both meet their long-term financial goals, BUT also stay calm during the inevitable correction and bear market. And if you want to use margin, just remember to use it with EXTREME caution because it’s a powerful tool that can both greatly increase wealth and also destroy it with alarming speed and violence. Ultimately the goal of every investor must be to build a bunker portfolio that is based on the motto “hope for the best, but plan for the worst”. While it’s popular to speculate about what will happen in the next quarter or year in terms of the economy or corporate earnings, the fact is that no one knows what craziness the market will bring in the short-term. So rather than obsess over market timing (historically impossible even for the largest financial institutions) and trying to avoid short-term volatility, investors need to be prepared not just to survive whatever Wall Street throws at you but actually profit from it. Remember that every crisis is also an opportunity, and fortune favors the prepared mind. 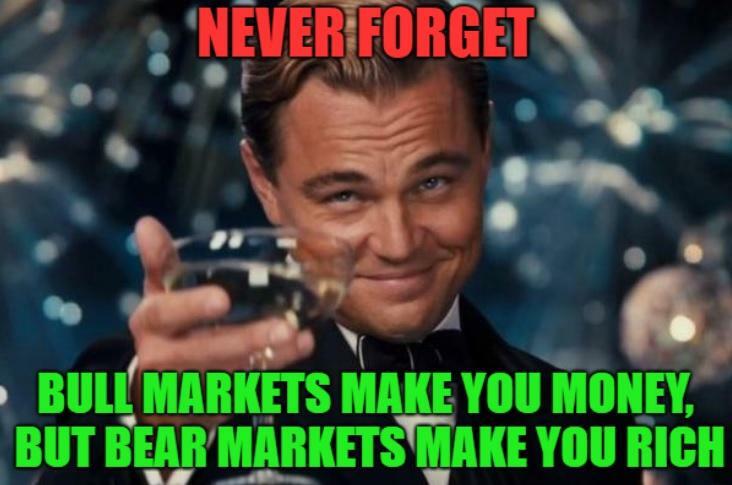 If you are careful in how you construct your portfolio, then you can benefit from the fact that bull markets make you money, but in the long-term, it’s bear markets that make your rich. unchainedmusic.com is prowdly powered by Wordpress · © 2009 · All rights reserved.